There are a few home truths about an outing to the movies that cinephiles would probably rather not know and that might just change the way they think about their next visit. 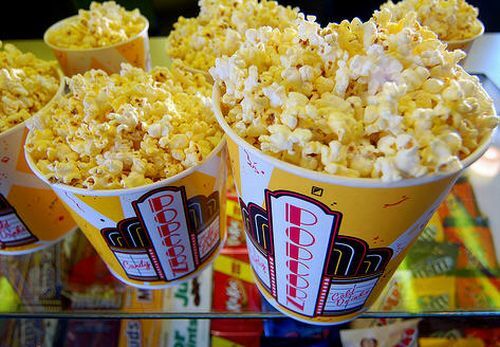 Perhaps the most startling is that popcorn is often doused in coconut oil and chemicals to give it that irresistible aroma that wafts from the concession stand where cinemas make up to 40% of their revenue. Not only this but punters should not be fooled by the churning machine and the warmth of the seemingly fresh popcorn; the tasty snack lasts for two days and might well be served up from yesterday’s batch. A list compiled by Good Morning America and Reader’s Digest also reveals how cinema employees themselves stay away from the pretzels, hot dogs and nachos knowing how stale and old they are and that the nacho cheese may have been sitting out for days before it is melted and poured over chips. The only foods they trust according to an anonymous source who provided much of the information to Reader’s Digest, is the popcorn, boxed candy and beverages. Moreover, between showings, the remnants of those snacks that are dropped all over the floors are hurriedly swept under seats rather than into the trash. “Your suspicions are correct,” writes a cinema worker. Employees aren’t that bothered either by cheeky cinema-goers who sneak in for double bills without paying or those who use cell phones, according to the list. “I know all the methods you use to sneak in. I just don’t always care enough to kick you out for it,” says the source who explains that most people who use their phones are the young audience members that cinemas want to keep attracting, hence the lack of enforcement. But they aren’t that relaxed when it comes to handing out free merchandise. At the end of the day an inventory is taken so extra cups are rarely provided for large soda sharers no matter how many times you ask. Tech geeks who assume they are getting a better experience by going to see an “Extreme Digital” screening are mistaken if they believe it is better than Imax. Theatres charge more but it is lower quality than Imax and easier for the cinema to maintain. Where you can ensure the best movie experience, however, is by picking a seat right in the middle of the auditorium where sound checks for optimal audio are conducted. Too far out to the side and sound might be distorted. When it comes to the best deal for your cinema outing, GMA suggests getting discounts and coupons at Sam’s, Costco or Triple A where you can save 25% on ticket purchase. Where you can’t save money though, is back at the concession stand. “Combination deals don’t save you money at some theaters. You’d pay the same price if you purchased the items separately,” admits the Reader’s Digest source. But you can watch out for staffers trying to up sell a large popcorn for only 75 cents more than the medium. Cinema employees tend to stick together, explains the employee. If you complain about something, “the manager might pretend to yell at me for a minute, but he’ll pat me on the back the moment you’re out of sight”.